We know that several users of SmallBusiness.com travel for business a lot, so we’re always glad to pass along ideas to make flights a bit more bearable. That’s why we couldn’t resist posting this clever idea posted by Reddit user @randomusefulbits. As shown, it uses a tray lock as a clip to secure your phone. 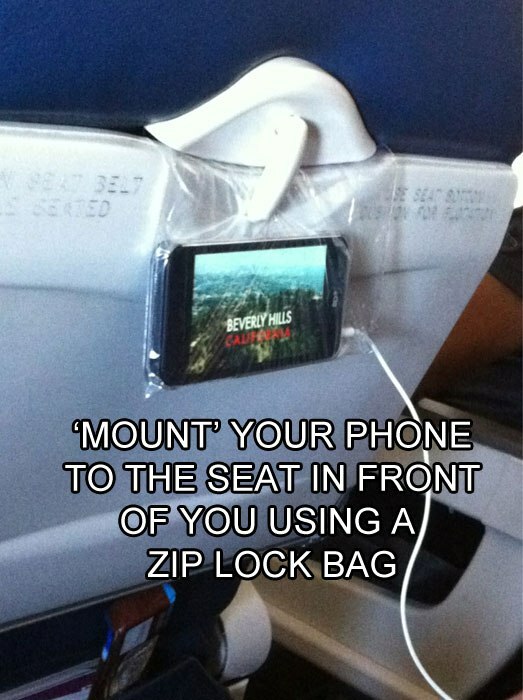 Just put your phone in the bag and clip it to your tray table. The trick works best with wireless headphones, but your wired earphone works if you punch a hole into the Ziplock. Best part | If the passenger in front of you reclines their seat, the bag will quickly rock back into easy viewing position. Yet to try | We have some flights next week during which we’re going to test the approach with an iPad Mini and a gallon-sized Ziplock bag.